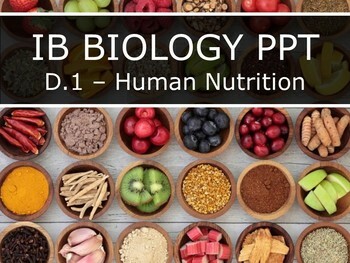 This 59-slide Powerpoint presentation covers 'Option D.1 - Human Nutrition' in the 2016 IB Biology curriculum. Each slide includes the specific learning objective as well as key vocabulary that students should note. The presentation itself contains minimal information as it is intended to be used with teacher guidance. There are sometimes 'Video' slides throughout which link to relevant and informative YouTube content. The slides are formatted to be visually pleasing and to also print well for handouts or revision. Please see the preview file (first 8 slides) for an idea of the aesthetic and level of detail in the presentation. The relevant 'Essential Knowledge' can be found below. I have had success using these presentations to review topics after students have been exposed to the material at home. I typically have the class read relevant material (book, site, etc.) and then watch the videos the day before introducing a topic. During the class period, I use the slides to structure the discussion around the IB Bio Understandings. The remaining class time is spent reinforcing the knowledge or working on activities, written test practice, or nature of science. As always, please let me know if you have any suggestions for improvements. These are always a work in progress! 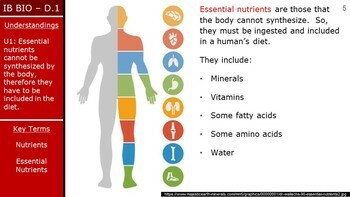 U1: Essential nutrients cannot be synthesized by the body, therefore they have to be included in the diet. 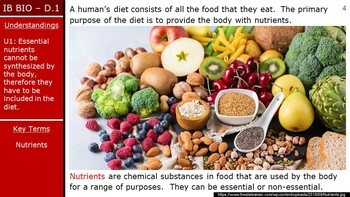 U2: Dietary minerals are essential chemical elements. 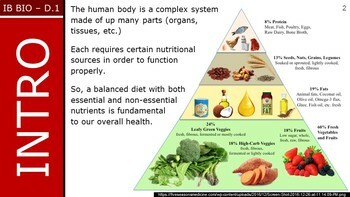 U3: Vitamins are chemically diverse carbon compounds that cannot be synthesized by the body. U4: Some fatty acids and some amino acids are essential. U5: Lack of essential amino acids affects the production of proteins. U6: Malnutrition may be caused by a deficiency, imbalance or excess of nutrients in the diet. U7: Appetite is controlled by a centre in the hypothalamus. U8: Overweight individuals are more likely to suffer hypertension and type II diabetes. U9: Starvation can lead to breakdown of body tissue. A1: Production of ascorbic acid by some mammals, but not others that need a dietary supply. A2: Cause and treatment of phenylketonuria (PKU). A3: Lack of Vitamin D or calcium can affect bone mineralization and cause rickets or osteomalacia. A4: Breakdown of heart muscle due to anorexia. A5: Cholesterol in blood as an indicator of the risk of coronary heart disease. S1: Determination of the energy content of food by combustion. S2: Use of databases of nutritional content of foods and software to calculate intakes of essential nutrients from a daily diet.